I have had the pleasure of being out with large groups and let me tell you, it’s a game changer, especially in New Hampshire, where there aren’t a whole lot of police in most towns. 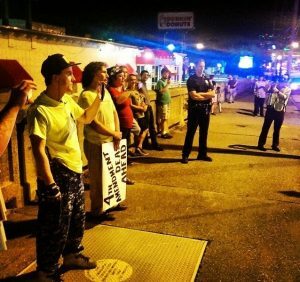 Even in its biggest city of over 100,000 people, Manchester, the police DUI checkpoints have basically been shut down by groups of up to a few dozen people. The DUI checkpoint activists come out every time the police do a checkpoint and the activists bring reflective signs, cameras, two-way radios, and set up at strategic locations to alert drivers to the existence of the checkpoint and encourage them to turn away. At a recent such event, there was a relatively small turnout of only about a dozen people and they reported 90% success at getting cars who were going to turn into the checkpoint road to turn away from it instead! There was one arrest at the event, as a couple visiting Keene copblockers ventured away from the group to target the checkpoint directly with their cameras. 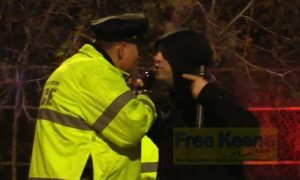 Activist Christopher Waid was threatened and arrested as he crossed the street into the median. You can check out video of that here. What would have happened if there were a dozen people backing Chris up instead of just one? Having good communication and dedicated activists is key. I’ve seen police leave their pullovers much faster than normal once a couple of copblockers show up on-scene. With a large number in the streets, you can affect multiple police stops simultaneously and really help innocent victims of police harassment in a much bigger way. Two-way radios and group messaging apps like Telegram and Riot are excellent ways to coordinate on the ground and in advance. However, for most of you reading this, having a dozen people out in the streets together is a mere fantasy. The reality is, you’re toiling away alone or with very few allies, and it’s been that way for years. If you could use some backup and you are of a libertarian mindset, you really need to make the move to New Hampshire, the place where both founders of Cop Block, Pete and Ademo have called their home. New Hampshire has been the destination of a libertarian activist migration now for over a decade, many of whom are Cop Block supporters. If we who support police accountability can concentrate our activism in one state, we can have a much greater impact. We’ve already proven that in New Hampshire, but we still need more help. Numbers are a game-changer. If we can outnumber the police at any given event, the tide will turn in our favor. Are you willing to step up? If so, check out the two current migrations of liberty activists to New Hampshire, the Free State Project and the Shire Society and start planning your move ASAP. Let us know you’re coming and get connected via the NH Copblock group on facebook or the Shire Forum.